Who will the Utah Jazz face in the playoffs? We break down the possibilities. 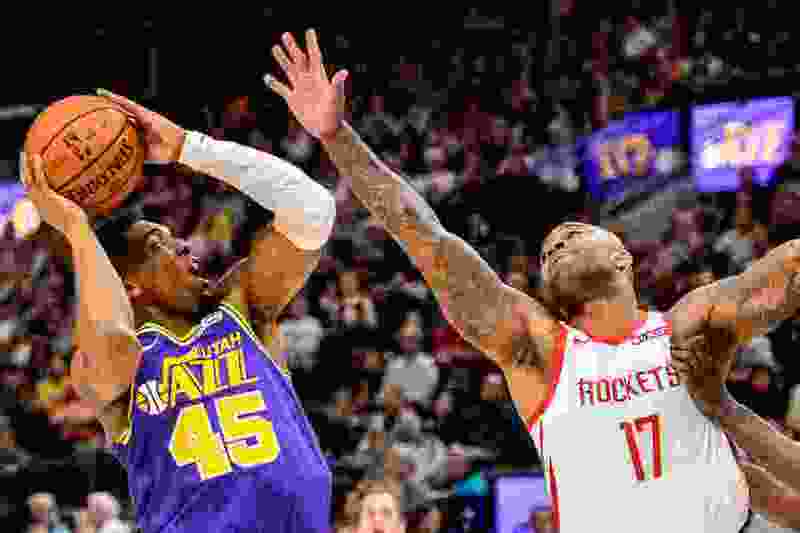 (Trent Nelson | The Salt Lake Tribune) Utah Jazz guard Donovan Mitchell (45) defended by Houston Rockets forward PJ Tucker (17). The Utah Jazz host the Houston Rockets, NBA basketball in Salt Lake City on Thursday Dec. 6, 2018. Even with just two games left in the season, there’s still so much we don’t know about who the Jazz will face in the NBA playoffs. Start here: the Jazz will likely be the fifth seed for the third consecutive season. They could still move up to fourth, but doing so would require the Jazz to win their remaining two games — at home against Denver on Tuesday, then in L.A. on Wednesday against the Clippers — and Portland to lose their last two games against the Lakers and Kings. If they do, Portland will be Utah’s opponent, but the Jazz would have home court advantage in the series. Likewise, Utah could slip back to sixth if they lose their last two games while the Oklahoma City Thunder win their last two. About the Jazz • Dante Exum (knee surgery), Kyle Korver (knee soreness), Ricky Rubio (hamstring tightness) and Raul Neto (ankle soreness) are all out for the Jazz vs. Denver. ... Derrick Favors is probable after missing the last four games due to back spasms. ... Jazz will need consecutive wins by Oklahoma City or consecutive losses by Portland to finish anywhere but fifth in the Western Conference for the third straight season. About the Nuggets • Denver rested Nikola Jokic, Jamal Murray, and Paul Millsap for Sunday night’s game against the Blazers to try to move Houston out of its side of the playoff bracket. No word on whether or not they’ll be available vs. Utah. ... former Jazzman Trey Lyles scored 15 points and added nine rebounds in the weakened starting lineup. ... Nuggets are the best offensive rebounding team in the league, getting 26.8% of their own missed shots. OKC faces two tougher tests, though: they play Houston on Tuesday in Oklahoma City, then travel to Milwaukee to face the league-leading Bucks. The Bucks will likely be resting all of their top players given that they’ve clinched home-court advantage throughout the playoffs, but they’ve proven feisty even without their top guys at times. But the really big question in the West is who ends up in third and who ends up in fourth. Thanks to Denver’s efforts to tank against Portland on Sunday night, the West picture for those two seeds is very complicated. Houston is most likely to remain the third seed. They even have an outside chance to make it to the two seed if Denver loses out — their last two games are against the Jazz on Tuesday and at home against Minnesota on Wednesday — or if Houston beats OKC on Tuesday and Denver loses either of their two remaining games. Houston can also slip down to four by losing their Tuesday game to Oklahoma City, while Portland beats the Kings and the Lakers. If that happens, the Jazz will face the Rockets. In every other scenario, the Jazz will face the Portland Trail Blazers. Monson: Kyle Korver’s never done anything more important than this. Take note. The possibility of playing Houston could frighten Jazz fans, given the struggles the Jazz had against the Rockets in last year’s playoffs and during the season so far. In many ways, Utah’s game against Denver might matter less to the Jazz than the oft-mentioned Rockets/Thunder game, which starts a half-hour after Utah’s 7:00 tip-off. Given how unlikely it is for the Blazers to lose their next two, the case can even be made that a Jazz loss against Denver would be a good thing, giving them a chance — still a small one — to move to six on the final night of the season if they feel it would mean a better matchup. There’s no indication yet, though, that they would do such a thing. After all, the Jazz’s culture is about getting better every night, and it’s hard to keep that as a goal when losses are asked for. Playing well going into the playoffs matters too, as does re-adjusting to playing playoff-caliber opponents.